Sony Announces Thin Cameras Big on Features | OhGizmo! I usually shoot pictures with a Nikon D80, but I still like to keep a nice, small point-and-shoot around for the times I don’t feel like hefting the behemoth D80 around. A thin point-and-shoot that can be slipped into a pocket or backpack is a welcome addition for most people who like to shoot with more advanced cameras typically. Sony announced a pair of new cameras this week that are perfect for those looking for thing cameras. The DSC-T77 is very thin at under 5/8-inch thick — making it perfect to complement my DSLR. The T77 may be thin, but it still packs in lots of features including a large 3-inch touch sensitive LCD, Smile Shutter, face detection and ISO sensitivity up to ISO 3200. If you can live with a camera a bit thicker, the Sony DSC-T700 is the brother to the T77 is slightly more than 5.8-inch thick according to Sony. The T700 has a 3.5-inch touch sensitive LCD and a massive 4GB of on-board storage allowing you to keep up to 1000 full resolution images on the camera for photo album style sharing. Both cameras use Carl Zeiss lens technology and 4x optical zoom along with Optical SteadyShot image stabilization. Both cameras will be available in September with the T700 retailing for $400 and the T77 going for $300. Amazing camera it includes a large 3-inch touch sensitive LCD, Smile Shutter, face detection and ISO sensitivity up to ISO 3200. 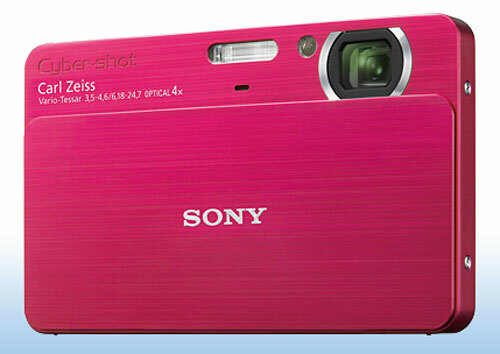 I liked that camera especially its pink color. great cameras, Both cameras use Carl Zeiss lens technology and 4x optical zoom along with Optical SteadyShot image stabilization.